All the news seems to be about Donald Trump losing the election—or losing it in a landslide. But there are many variables out there. They include the “shy voter” or “Brexit effect,” in which Trump’s support is much higher than polls say—because his supporters don’t want to talk to pollsters, or are embarrassed or defiant enough not to tell the truth. Another variable is the possibility of “yuge” turnout by white voters. Nate Silver’s Five Thirty Eight is offering a description of how this would play out, and what the newspapers might say on November 9. In a stunning rebuke of elites, Donald Trump edged out Hillary Clinton for the presidency last night, jolting world markets and sending shock waves across a beleaguered political establishment. 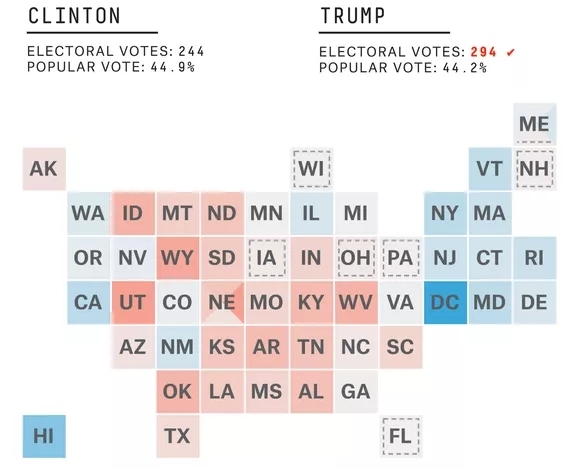 Trump captured 294 electoral votes, flipping Florida, Iowa, New Hampshire, Ohio, Pennsylvania and Wisconsin to the GOP column. With millions of votes left to tabulate in California and New York, Clinton was on track to win a worthless popular vote plurality. After one of the worst polling misses of all time, election “forecasters” and experts were left scratching their heads. Trump credited his “Silent Majority” for swarming polling places and himself for leading a blue-collar revolution. Indeed, turnout among whites without a college degree surged from 55 percent in 2012 to 64 percent in 2016, and Trump carried them by 35 percentage points. Validating the “shy Trump voter” theory, Trump defied expectations by nearly tying Clinton among whites with a college degree. Democrats faulted third-party “spoilers” and a lack of enthusiasm among their base for Clinton’s loss. Latinos voted for Clinton by 47 percentage points, but their turnout barely increased over 2012. Meanwhile, African-American turnout fell to 56 percent from 63 percent four years ago. Libertarian nominee Gary Johnson, Green Party nominee Jill Stein and Independent Evan McMullin combined for 11 percent, severely eating into Clinton’s margin among millennials.
. . . in his victory speech, Trump immediately praised the integrity of the vote, congratulating state and local officials on their “tremendous” work to ensure a fraud-free election. Here’s the map that illustrates the article’s premise. The states have been “blocked” to make it easier to see the large and small states equally. Note that the flipped states have dash lines. Trump has been preparing the world for this outcome. The American Thinker says Trump’s win comes down to a need for change, and a billionaire’s ability to speak to those who are struggling.
. . . the existence of two American English languages and those who speak them. I contended that one of those languages is spoken by an American “establishment” that includes well educated and self-styled “sophisticated” men and women with political views across the board – left, center, and right. This is a social aristocracy that is, as it is very American, not inherited by money or class, but culturally transmitted by education, occupation, and personal preference. The other language, which employs the same vocabulary and syntax, is spoken by a large number of men and women usually (but not always) with less education, often lower-paying work, and their own set of cultural preferences. Each group is aware of the other, but there is relatively little interaction between them other than when they must transact perfunctory business, services, and other daily contact with each other. Hillary Clinton is the 2016 representative of the former, although those who are conservative and others who are more radical do not necessarily like her or plan to vote for her. Donald Trump is the representative of the latter, although those who are liberal or very conservative do not necessarily like him or plan to vote for him. Moreover, while Mrs. Clinton was born into her group, Mr. Trump was not born into his. Donald Trump was born into wealth, privilege, private education, and high culture. But his business life, which has absorbed him most of his adult life, has brought him into constant and close contact with those who worked for him in the construction business. According to those who know him best, Mr. Trump was not a distant, uninvolved boss. Rather, like so many who are very successful, he mixed freely with his workers and, very importantly, listened to what they told him. As a result, he not only learned their language, but also gained an understanding of what was important to them. It is their language he has been speaking in the 2016 campaign and their concerns he has tried to address – and that is why, in my opinion, the so-called educated and cultured class, even those who are traditionally Republican and conservative, have failed to understand his success in the 2016 nomination campaign. They are tone-deaf to the language of those who speak the “other” American English. . .
Ronald Reagan was a movie star governor who spoke in a non-establishment language. Not only Democrats, but many Republicans did not take him seriously. Walter Mondale was a career politician who was smart, witty, and well informed, and he spoke the establishment language with almost perfect pitch. He seemed clearly to out-debate Mr. Reagan in their first debate, and he openly declared that he was going to raise taxes and increase the role of government if he became president. Large numbers of working-class Democrats then voted for Mr. Reagan, who won in an historic landslide. Previous articleCould Trump Win if the Election were About Issues? Those on the losing end always think the polls are wrong. Trump is a walking disaster who has earned the coming loss. I just hope all the exposure and revelation of the true Trump colors ruins him and his family in all future endeavors. I read that 538 article, it basically says that the polls are right, Clinton is the overwhelming favorite and Trump is most likely headed for a crushing defeat. Yet Trump spends every day claiming the polls are wrong and he is cruising to victory. Hence my reference to “those on the losing end”. The part about Trump exposing his true colors and ruining himself and his family is just my way of saying I hope he gets what he truly deserves. I don’t quite get your point, are you agreeing or disagreeing with me? I have heard at every election about “the lesser of two evils”. I refuse to believe that over the past sixty years that we have never had a good candidate. There have been bad candidates, Trump and Reagan to name a few, but we have had many that I have been excited to support. Hillary Clinton is one whom I am very excited to support. She is experienced, thoughtful, smart, and right on all the issues that count.She promises to appoint Supreme Court judges who will not turn the clock backwards on equal rights. She promises to move us along on important issues like jobs, healthcare, and social security, without promising things that she can’t deliver. If you find that you can’t support any candidate, you might find that the problem is with you and not the candidates. I think the Trump supporters are crazy, but at least they are not afraid to make a commitment. Haven’t you heard the same from other so called experienced people? If their so great why are there still massive problems. How is she no different? She promises and promises. She’ll come up with some health care system that is really cheap Then like Obamacare the premiums will double or triple. All talk, right? Healthcare premiums were going up double digits in the 90s. Most of the premium increases will be covered by the subsidies, not the insured. Most of the problems with the ACA stem from Obama trying to work with Republicans. That is why there is no public option. In case you haven’t heard, Hillary Clinton first started working on universal healthcare in 1993, and has earned a lot from her failure then. She has also learned that the Republican party is a party of obstruction and she must overcome that factor to effect change. She is proposing not only a cheaper public option, but also allowing those 50 and older to buy into Medicare. She is proposing to raise the earnings cap on social security taxes to secure the social security trust fund and expand benefits, not cut them as republicans want to do. If you want privatized social security and voucherized Medicare, vote for Trump. You might get lucky and get a bonus nuclear war because some Iranian sailor flipped one of our sailors off. The Kennedy liberals said the insurance companies got everything they wanted with the ACA. The insurance companies Will always get what they want. Do you really think those that built the US are going to roll over and let some do what ever they want. Reid once said to an opponent you don’t know who controls the country. It isn’t the Republicans or Democratics. They are mere figure heads. So are you sure the Republicans are the problem? Too bad the polls don’t show HC wining by 50 %. Then the dead and illegals would stay home and not bother voting for her. The polls show Clinton far enough ahead to be sure that she will have a clear victory. Your comment about voter fraud doesn’t even deserve an answer. Even you aren’t that stupid. Lol. I can tell your young. The dead have been voting in Chicago for generations. Check your history. I am 62, and have followed politics since the Watergate break in. There has never been enough voter fraud in any election to effect the results. Voter supression by Republican state officials has a much greater chance of effecting election results. Lol. Do you really think just the Republicans are involved in voter suppression? I really didn’t think that voter ID laws were supression until it came out that after passing voter ID law in Mississippi, they went on to close department of motor vehicle offices so that some people would have had to travel fifty miles or more to obtain that ID. That was enough to convince me that it was indeed meant to suppress the vote of the poorer people. Also several courts have said, in recent years that Voter ID laws are an attempt to suppress voter turnout. These types of laws are always put in place by republican state governments. Also Trump’s campaign has announced not one but three plans to depress voter turnout. Also the RNC is under a consent decree for voter intimidation that they were found to be guilty of back in the 80 s.
So, in short, I think it is obvious that Republicans are indeed involved in voter suppression. Can you offer any evidence that they are not? Wow. In all our exchanges I have come to realize that you are a liberal zealot, but I never thought that you were SPITEFUL. Just wishing Mr Trump that which he has worked so hard for. I think that to lose his opulent lifestyle and to have to live the life he has earned will be fitting reward for what he has tried to do to this country. I would say when you wake up on 11/9, you will see what a loser Trump is, but the reality is we will see a Clinton victory (read landslide) by 8:00 pm EST. Then Mr Trump can busy himself with ourt dates about Trump U fraud case, like the civil suite brought by the woman he raped when she was 13, whatever comes from the nvesyigation into the Trump Foundation. There’s more, it you get the idea. I never had much respect for the Republican party, but with Trump out of the way maybe they can get back to being merely despicable. Lol. Do You actually believe that Trump sits around with nothing better to do than to go to court? Sometimes you go to court because it is compelled to, not because you have nothing better to do. Do you realize he’s a billionaire? I don’t think you do. Try reading a book. This is the type of person who blows through $35,000 in a weekend. I realize he is richer than I am. That said, I think he lives above his means and likes to make people think he is much more rich than he actually is. I think that is one of the reasons he has refused to show his tax records. As far as reading a book, if you are talking about one of the glorified pamphlets that Trump has hired others to write and then took credit for, no thank you. If you are talking about real literature, I would be happy to compare my reading habits to yours any time. Since learning to read I have always been an avid reader, usually reading two or three books at at any given time from a wide variety of authors. I always made time to read but since I have retired I have much more time to devote to reading. I also skip the political “best sellers”. If the subtitle is longer than the first chapter, best to pass it by. I have been reading, recently, about how bookings in his hotels and sales in his properties are down as much as 59%. It seems that the more of the true Donald Trump is revealed through his campaign, the less people like or trust him. The one bright spot in his candidacy is that maybe it will ruin him as a businessman as well as a politician. At any rate if he doesn’t simply explode after losing this race, by having a heart attack or stroke, he will most certainly slink away with his tail between his legs because Donald Trump doesn’t lose. I’d suggest you Google Forbes list of billionaires. Certainly you’d believe them, right? Your candidate could, if Comey does what is right, face jail time. Would you really vote for a crock? You are right, I could never it’s for a crock, or even a crook. That is why I am proudly voting for Hillary Clinton. If Comey does what is right he will release all the information on Wieners emails to prove that there is no evidence there to connect Clinton with any wrongdoing. Comey is trying to protect himself from the overzelous republicans in the house who have already promised to investigate Clinton for as long as she is in office. They will try to obstruct her Even if it damaged the country. Interesting that you should mention Forbes, as they say that though he is much richer than I am, that he is worth less than half of what he claims. If he would release his ltax returns, as Clinton has, we would know the truth. If you want a lying, racist misygonistic, homophobic narcissist in the most powerful office in the world, then by all means vote for Trump. I am quite sure he will care more for you than he does for his family’s wealth. Even with this Comey throwing out this crap to make himself Look good, Trump is headed for humiliation, I hope all you Trump lovers enjoy it. I know I will. Certainly you don’t believe the politicians will lose any sleep if they win or lose do you? They’ll slap each other on the back as they’ve made it in life. Seems only people like you wish the worst for others. It’s one thing to think I voted for the winner. It is another thing to wish that harm would come to another person simply because you disagree. Comey didn’t open the investigation because of a person like Wiener. Give me a break. Comey has something a lot bigger. His own agents have said that. He knows he screwed up the first time. It has to do with corruption. Forbes lists Trump with having 4 billion dollars. That is 4 billion dollars probably just in the States. If Trump loses what type of lifestyle do you really believe he’ll live? He s so convinced that he cant lose that he I’ll probably have a breakdown, or a stroke. No. Nothing stops Trump. There is never a “loss,” only a “setback.” I seriously don’t think Trump will mind at all. He’ll see it as once again being cheated by others, that he did the best he could, that he is universally loved, and that he can use this “learning experience” to make a lot more money and have a lot more power. Do you find that being so narcissistic that you can’t recognize an absolute failure of your plan to be a positive character trait? I am not talking about resiliance and drive, but about an absolute inability to recognize when you have failed. It is good reading, escapist fantasy usually is. What was fantasy yesterday is reality today.Likewise what you think is fantasy will soon become reality. If true he’d go back to his opulent lifestyle, right? Look at how his businesses are doing, he may not have much opulence to go back to. That’s what you want to believe. He’s probably got more money in other countries than he has in the States. There’s a saying that if all the wealthy were to give up their money to the average Joe it would be back in their hands shortly. We, the average Joe, would buy cars, computers, houses, refrigerators, boats, etc. Well the wealthy own those companies. If you believe he “has more money in other countries” and you know he does all his manufacturing in other countries, what makes you think he will be able to convince others to do what he ? By which I mean why can he convince other businessmen to bring jobs or their money back to this country? Trump, if elected, would make decisions based on what would benefit his family’s businesses, not Americans. That would include continuing to outsource all his manufacturing, bringing foreign workers in on visas to take American jobs. He would be a rubber stamp for Ryan’s budget killing Social Security and medicare, and appoint Supreme Court judges who would in the name of religious freedom would set the clock back fifty years, and remove all safeguards against criminals purchasing guns. But then, maybe you are a racist and a homophobe who elieves that anyone not exactly like you deserves nothing but your hate. If that is you, then go ahead and vote your hate. What you said couldn’t be any further from the truth. Your probably just upset that Trump is as wealthy as he says he is. I guess reality has hit and you now know Trump’s businesses won’t fold as you’d hoped. I guess you haven’t listened to any of the debates or any of his speeches. He’s outlined in detail how he’d bring back jobs. Please read/watch something other than liberal media outlets. You can say I’m a hater. It isn’t true but go ahead and think what you want. Your going to anyway. Since you believe Trump supporters are haters I guess you think your candidate is pure, That you know best. The rest of us are racists, etc. But doesn’t that mean your the racist/bigot, etc? Aren’t people allowed to believe what they want? Or does it have to meet Your standards? 1. I am not upset that Trump is wealthy. Though I know that he is much wealthier than I am, I don’t BELIEVE that he is as wealthy as he pretends to be. His businesses may well survive, but they have taken hits over the course of the campaign with bookings at his resorts being down as much as 59%. 2. I watched every minute of each debate, both in both primaries, and all three general election debates. I have seen many of his speeches, not all, because not all are carried in full on tv. There is simply not enough time to seek out every speech online. As far as his plan to bring jobs back, he says he will lower taxes on businesses and enact tarriffs on goods brought back in. A president can do neither of these things without action from Congress. Even if he manages to get his tax cuts enacted, those savings pale in comparison to money saved on wages and benefits paid to workers in developing nations. As a matter of fact taxes, wages and benefits are all cheaper in Those countries so it is unlikely tax cuts will do much to bring jobs back. He also can’t enact tarriffs without action from Congress, and neither party has shown a willingness to enact any tarriffs, so that seems unlikely to bring back jobs either. And on top of all that, I have not heard one word about how he will bring his own manufacturing jobs to this country. How serious are other businessmen going to take his plans when they obviously don’t apply to him? 3. You, personally may not be a hater or a racist, but you are supporting one of the most bigoted and racist candidates since George Wallace. You absolutely do not have to meet my standards, but your candidate does have to answer to the world’s standards. And according to those standards calling all Mexicans rapists and murderers, all Muslims terrorists, and saying all black people live in hell is definitely racist. Claiming you don’t know that the Klan is a white supremecist group, while your own father was a Klansmem is considered racist. 4. Recognizing racism does not make one a racist. Calling out racism does not make one a racist.